"Rocketed from a distant planet to a bold new destiny on Earth, found by a Kansas family and raised as Clark Kent, he learned he possessed the strength of steel, the speed of light, and the desire to help all mankind! He is SUPERBOY!" Beginning in 1988, executive producers Alexander and Ilya Salkind, the same father-and-son team responsible for Superman the Movie, brought Superboy to television in a show remarkably faithful to the sensibilities and ambience of both the Superman and Superboy comic books. 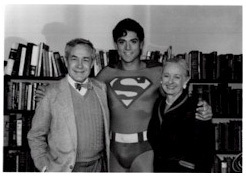 Comic book writers had much more input into Superboy (later renamed The Adventures of Superboy) than they had previously had into any other live-action dramatization of a super-hero. Such DC writers as Denny O'Neil, Cary Bates, and J.M. DeMatteis were among those who contributed to the series. In addition to a young Clark Kent and Lana Lang, traditional comic book characters like Bizarro and Mr. Mxyzptlk made appearances. 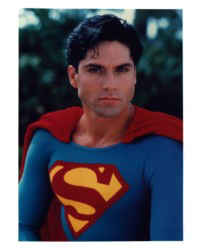 John Haymes Newton was initially cast for the dual role of Clark Kent and Superboy. He gave a very convincing performance and the show featured a young Clark Kent attending Shuster University along with Lana Lang and T.J. White. After 26 episodes, Newton was replaced with newcomer Gerard Christopher. Gerard was a student of Superman lore who had clearly studied the performances of preceeding Superman actors - he quickly became a fan-favorite as Superboy. As a result of his own enthusiasm and prior experience, he eventually became both a producer and a contributing writer to the show. His fan background brought something extra to the series and it consistently placed among the top ten syndicated programs. The part of Lex Luthor was also recast, scripts continued to improve, and the effects began to rival those found in the feature films. When Superboy graduated from Shuster University and took on a full-time job with Lana at the Bureau for Extranormal Matters, the show developed into a succession of well-crafted and authentic Superman stories. SUPERBOY DVDS NOW AVAILABLE ! Sources: Superman: The Complete History by Les Daniels and the Official Gerard Christopher Web Site.